Shut up. Go away. You hate America. Clearly Lefty's has died down over the summer, because an issue that has undoubtedly been on all of our minds has been left without discussion. I'm going to change that. Park51. Cordoba House. 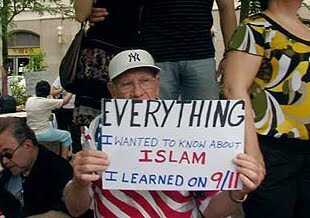 Or, as it is more commonly known, the Ground Zero Mosque. Call it what you will, the hot topic in recent news has been this 13-story Islamic community center, planned to be built near the site where the World Trade Center towers once stood. You all know the background. The center's construction was approved almost unanimously. It's not located on Ground Zero - it's two blocks away. And it's not even a mosque, at least no more so than a YMCA is a church. In 2006 Glenn Beck seemed to have no problem with the Imam behind the center, calling him a "good muslim." The lot, once home to a Burlington Coat Factory, is no closer to Ground Zero than strip clubs and betting parlors. But tiny details like that don't matter. Since hate-monger Pamela Geller picked up the story, Park51 has been the Ground Zero Mosque, a victory flag raised by those who hate America, freedom, and Jesus. It has been a place for terrorists to congregate, amongst the ashes of dead Americans. It has been a disgrace to the memory of that fateful day. It makes me physically ill. And make no mistake, by "it" I don't mean Park51. I mean the people opposed to the center. It's not just Islamophobia, it's political fear-mongering at its worst. Newt Gingrich essentially called all Muslims 'Nazis', and he is getting away with it. The right is trying to convince America that this is a radical mosque built directly on Ground Zero, and people are easy to convince. Of course, I expect this from the right. We have an election coming up, and this is a great way to hurt the left. Either politicians support the center and lose votes, or oppose it and lose other votes. Democrats are falling into the trap. Harry Reid, coward that he is, would rather side with the likes of Glenn Beck and Newt Gingrich than risk losing reelection. Even Obama has been timid, barely supporting the center. Is this what we have come to? Americans really can't separate terrorism from Islam? I'm about to say something I never thought I would say; I think I am going to have to take a shower after I write it, it feels so dirty: I miss George W. Bush. Unlike most national politicians, he was a religious man, and I don't think he would have stood for this. Remember, back when we were on the verge of invading Iraq, what the justification was? The whole idea was that the (Muslim) Iraqi civilians were good, freedom-loving people, and that Saddam and Osama were victimizing them. Granted, Bush got the whole Saddam/Osama thing terribly wrong, but at least he recognized that we have never been attacked by Islam. We were attacked by crazed murders brandishing a perverted concept of Islam unrecognizable to most Muslims, terrible people doing a terrible thing that we should all mourn, but that is not a reflection of Islam. Today, America has forgotten about that. Now, all Muslims are evil; Islam is evil. Demonizing Islam is going to hurt us, here and abroad. When those on the right call this mosque a terror shrine, they aren't just hurting the people behind Park51, they are hurting our war on terror. They are hurting General Petraeus. They are hurting you and I, Americans. I remember standing on the Staten Island Ferry, coming home with 200 other silent, reverent New Yorkers of every age, race, and religion, as we watched our city still smoldering a full week later. And it is with this backdrop that I can say to every politician spouting off and opposing the construction of this Islamic community center: “Shut up. Go away. You hate America."